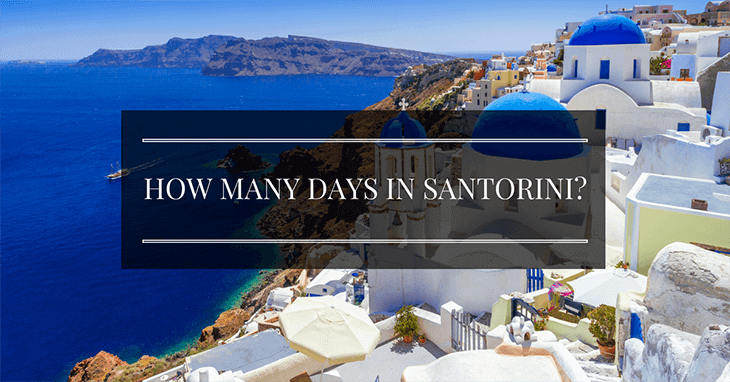 →How Many Days in Santorini? The newest craze is island hopping, and if you’re hopping your way around the Greek islands, you’re in for a treat when you land on this eye-wateringly beautiful island. Of course, you might be wondering how long is ‘enough’, i.e. how long should you spend Santorini, so you get to see the sights, but you don’t start to get itchy feet – well, three days in Santorini is generally the rule of thumb, however you can throw in beach days between sightseeing, and you could extend this to a week – the choice is yours. And remember bring your best walking shoes because you will do a lot of walking while you are traveling. So, what can you do for three days on this stunning, sun-drenched island? You’re on a beautiful Greek Island, the sun is beating down, and the weather is hot! 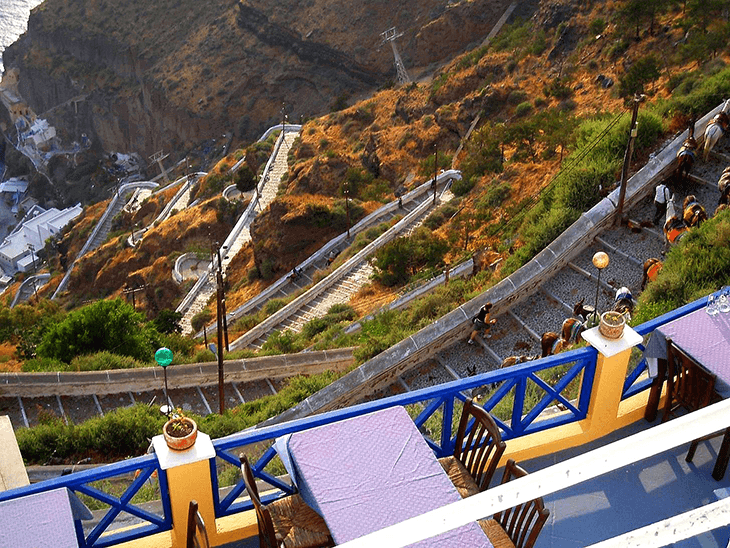 Of course, you want to cool down, and the perfect place (and way) to do this is by heading to the amazing site of Amoudi Bay. This is somewhere you will see people sunbathing on the rocks, and even diving into the crystal clear water below! Put simply, this is an area of natural beauty, somewhere you will gasp in wonder at, and for that reason alone, you should dedicate a full, relaxing day here. 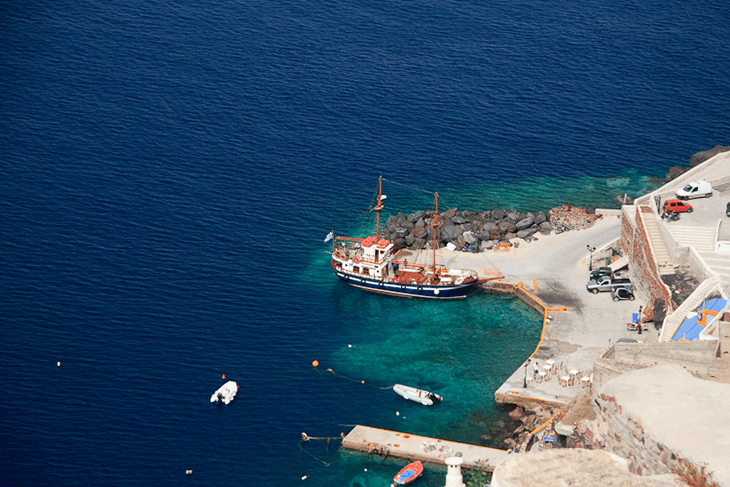 Getting to Amoudi Bay is a bit of a trek, but once you’re there, you’ll be glad you made the effort. The bay is hidden away, but simply asking a local how to get there will yield results. There are steep steps to reach it, so not the best for anyone who struggles with such things, but other than that, you should definitely make this your number one visit spot. There are also some fantastic seafood restaurants, albeit small ones, around here, with freshly caught fare to enjoy. The Fira Trail is not the easiest walk in the world, but it’s certainly the hardest either, and it will give you photos to cherish forever. This is a full day’s job, and takes around three hours one way – you could then get the bus back in the reverse direction! Take your time and pass by those famous white-washed buildings, blue-domed churches, pink flowers, and stunning high coastal views. Locals will be more than happy to chat to you as you go, and there are plentiful stop-offs along the way. This is a great way to experience the slow pace of life on Santorini, and see the cultural side of things too, away from mass tourism. Santorini is actually a volcanic island, hence the black sand beaches dotted around. 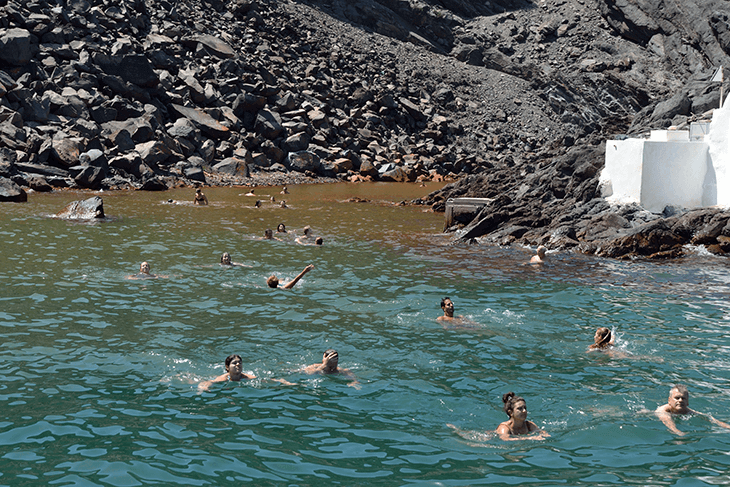 One of the most iconic activities to enjoy on the island is to hike around the volcano (yes, it’s active), by visiting the island of Nea Kameni, just a stone’s throw away, and then via boat, jump into the hot springs and enjoy the calming, therapeutic effects. Boat trips leave Old Fira port daily during the summer months, and for a great price too. Again, this is a full day out, and you’ll probably be exhausted at the end of it! These 3 days in Santorini will be actioned packed and a little exhausting, because the sun is certainly draining! Having said that, you will see the beauty of the island in abundance, before probably moving onto your next destination. If you spend too long on any island, or indeed any destination, you run the risk of becoming tired of it, and that would undermine the wonder of Santorini. There is a reason why this island is so iconic the world over, and once you get your first glimpse you will understand completely. Remember to take everything slow, just like the pace of life and the locals do, and you will be living the true Santorini life. On top of this, try and speak a few words of Greek, even if it is just ‘hello’, ‘thank you’, ‘please’, and ‘goodbye’, because the locals will be thrilled, and you’ll get so much out of your short visit as a result. Countless cruises and ferries visit Santorini every single day during the summer months, so getting to and from this amazing example of natural beauty is not at all difficult. The most difficult part of it all will probably be leaving! The great advantage about visiting Santorini for a few days, perhaps as part of an island hopping experience, is that it is a ‘try before you buy’ kind of deal, and you will almost certainly be back, full of memories of that bitesize trip to paradise. ​Here is some of our suggest hotels that you may interest in and hope it help you are pick the right one more easier. ​M﻿elte﻿mi Village Ho﻿tel: Great position, everything close at hand. Memories Beach Hotel: Memories Beach Hotel is located on the southeast coastline of Santorini, in the quiet area of Monolithos. Beside Athens, Santorini is a great destination in Greek, and we hope you satisfy with your question "how many days in Santorini?" and enjoy your travelling.